From a major period of reform in the 1960s to the present-day influences of the Affordable Care Act, Medicare has evolved into the largest healthcare provider in our nation for older Americans. 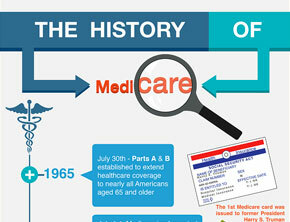 For 49 years, Medicare has passed significant milestones to become what it is today. Follow us back in time to learn the roots of Medicare and how it has changed in legislation and policy. In 1935, the Social Security Act was established and included federal assistance for Americans aged 65 and older. Decades later, on July 30th, 1965, the Social Security Act was amended to include Medicare, the health insurance program for nearly all Americans 65 and older and Medicaid, the health insurance program for low income Americans. Medicare is broken down into Medicare Part A (hospital insurance) and Part B (medical insurance). July 30th, 1965 is now considered Medicare’s birthday. In 1966, Medicare was implemented and more than 19 million individuals enrolled at an annual cost of $64 Million. Former President, Harry S. Truman was issued the first Medicare card in history. In 1977, the Healthcare Finance Administration was established by the Department of Health, Education and Welfare to administer the Medicare and Medicaid programs. The Department of Health, Education and Welfare became the Department of Health and Human Services in 1980. At this time, Medigap (Supplement Insurance) came under Federal oversight. Shortly after in 1982, the Tax Equity and Fiscal Responsibility Act provided the foundation for substantial growth of Medicare Part C managed care arrangements. This resulted in more health maintenance organizations, or HMOs, servicing Medicare beneficiaries. Medicare Part C also provides the ability to either choose a Medicare private health plan (HMO), or stick with Original Medicare. The Social Security Administration then separated from the Department of Health and Human Services in 1995. The next year, the Health Insurance Administration Portability and Accountability Act was set in place to improve the efficiency and effectiveness of Medicare. In 1997, the Balanced Budget Act ushered in new health plan choices & a coordinated Open Enrollment Process. In 1998, Medicare.gov was launched and then in 1999, a toll-free information line was set up. In 2001, the Healthcare Finance Administration became the Centers for Medicaid and Medicare Services, while continuing to administer programs. In 2003, the Medicare Prescription Drug, Improvement, and Modernization Act (MMA) made the most significant changes to Medicare to date and resulted in Medicare Part D. Part D is voluntary and makes outpatient prescription drug coverage affordable for nearly all Americans aged 65 and up. Part D is commonly explained with the “Donut Hole” metaphor, which describes the coverage gap, or limit, on what the drug plan will cover. More recently, the Patient Protection and Affordable Care Act of 2010, commonly referred to as the “Affordable Care Act” or “Obamacare,” was established to increase the quality and affordability of health insurance. Now, on July 30th, 2014, Medicare reaches its 49th birthday. Projections for the future include an estimated enrollment of 50 million Americans and over $540 billion in annual cost. With all of these legislation and policy changes, it can be a bit overwhelming to fully understand the Medicare system. This is the reason for SeniorQuote Insurance Services- to help consumers sort through the healthcare coverage options and find the best solution for each individual. This entry was posted in Featured, Insights, Need to Know. Bookmark the permalink.